Sometimes we would be thinking of inserting a picture with a cell which will be displayed when we hover the mouse cursor over the cell. 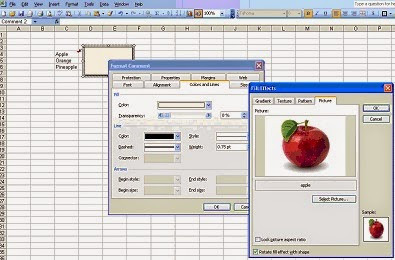 For example, assume you have created a list of fruits and now you think that if the user move the mouse over the fruit , the respective image of the fruit will be displayed. At such cases , this method of inserting picture as a comment will be very useful. Right click on the cell in which you need to add an image as comment. Now select Insert comment in the list as shown in the below image. A blank comment box will appear with a red triangle mark in the right corner of the cell. The red triangle in the top right corner indicates that there is a comment inserted with respect to the cell. Now double click on the blank comment box or Right click and select the option format comment in the list. The format comment box will be shown as shown in the following screenshot. In the Format Box, look for colors and lines section and click on it. Pick the drop down box corresponding to color. A set of colors will be visible and below the color boxes, you can find an option called Fill effects. Click on it. In the fill effects box, click on picture option and now click on Select Picture button. A dialog box to choose picture will open now. Choose the desired picture and select insert. Now your picture will be inserted in to the comment .Click ok to confirm the action. The task is done now. If you hover over the cell, your picture will be highlighted. You can rescale the size of the picture , just by dragging the picture from its corner.